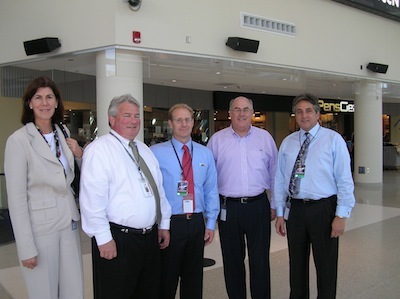 Gathered in the lobby a few hours before the Paul McCartney concert opens the arena are Liza Cartmell and Mike McDonald, Aramark; Jay Roberts, SMG GM at Consol Energy Center, Pittsburgh; Aramark's Dan Regan; and SMG's Hank Abate. The two sold out shows are the first for Consol Energy Center and the last on McCartney's U.S. tour. Barrie Marshall, Marshall Arts, who has worked with McCartney for years, told Venues Today that McCartney likes to open new buildings. He’s always looking for new markets and new buildings because “people are being given a better experience for their money in a new arena,” Marshall said. McCartney was set to play a second show Aug. 19, which concludes his “Up and Coming” summer tour which started in Phoenix and has drawn 600,000 people to 25 shows. For Jay Roberts, general manager of Consol Energy Center for SMG, this day was a long time coming. He’s put in some very long days for six months, partly because he was still operating Mellon Arena, the old home to the Pittsburgh Penguins of the National Hockey League, at the same time he was opening the new $321 million arena. Walking the floor before the opening with Liza Cartmell, president of Aramark Sports & Entertainment, was Aramark’s Dan Regan, and they were impressed. Cartmell pointed out the Brewhouse bar on the upper concourse, a pleasant space with a view of downtown Pittsburgh. It’s the kind of space not often seen on the upper levels, she said. Angus cheeseburgers were selling for $5.75; Italian sausage, $5.50; grilled chicken sandwich, $6.75; Smith’s hot dog, $4.75 and chicken tenders and fries, $8.50. A Pizza Hut Pizza was $9; WingStreet wings, $9.75. A large draft beer retailed for $7.75; a regular draft beer, $5; a regular soda, $4.50; a bottled soda, $4. The doors were held for 45 minutes because McCartney was late arriving from New York and couldn’t start his sound check until 5:30 p.m. The crowd gathered and when the doors finally opened, the concessions stands were slammed. The subsequent three-hour show had no intermissions, but people found time to buy food and drink. Merchandise varied from an $85 leather jacket to $40 T-shirts to $20 mugs and programs. McCartney’s tour arrived in 15 trucks and eight buses. The crew was returning to England Friday. No future tour plans have been announced. The brand new, state-of-the-art facility — the new home of the National Hockey League’s Pittsburgh Penguins — will open to the sights and sounds of legendary former Beatle Sir Paul McCartney on Aug. 18. The new facility is the last remaining professional hockey arena to be opened following a string of new openings over the last decade, and the second-to-last professional sports arena behind the Amway Center in Orlando. General Manager Jay Roberts is especially excited about the McCartney show as he considers him to be “the one that got away.” While working in operations for Mellon Arena — the facility that Consol Energy Center will be replacing — Roberts said they had a chance to host McCartney but couldn’t, due to lack of hanging capability. The $321-million venue’s opening date was actually moved up a couple of weeks in order to accommodate McCartney and have the opportunity for the venue to feature him as its grand opening guest, Goodman said. Designer Populous and project manager Pittsburgh Arena Development plan to open the facility by mid-August. SMG will lead a local consortium to manage the facility. Roberts said, for him, the highlights of the new venue are things that other venue managers probably take for granted, such as spacious rear loading docks and ample hanging grids, because these are things he has been surviving without at Mellon Arena for so many years. Not only will the new building feature five loading docks and tons of power, but it will also have a half house and upper bowl curtain system, which will give them much more flexibility in events. Plus, Roberts continued, the open concourse design will work well for sporting events but will also improve sound quality for concerts. The new center also boasts an incredible new HD video screen, Roberts said. “We got to see it for the first time during the McCartney press conference last week. It’s just incredible how clear it is. I was 20 feet away and it looked like I was watching it from my living room,” he said. The final event scheduled for Mellon Arena is a James Taylor and Carole King concert on June 26. King and Taylor performed together at the venue Feb. 26, 1971, so Roberts said it is fitting that they close down the old arena. The old building is currently in the final stages of the historical review process and, depending on the outcome, is scheduled to be torn down to make way for new development. Mellon Arena was built in 1961.